Last year, I did a Two for Tuesday on San Gennaro cannoli and compared the cannoli from Ferrara and La Ferrara. 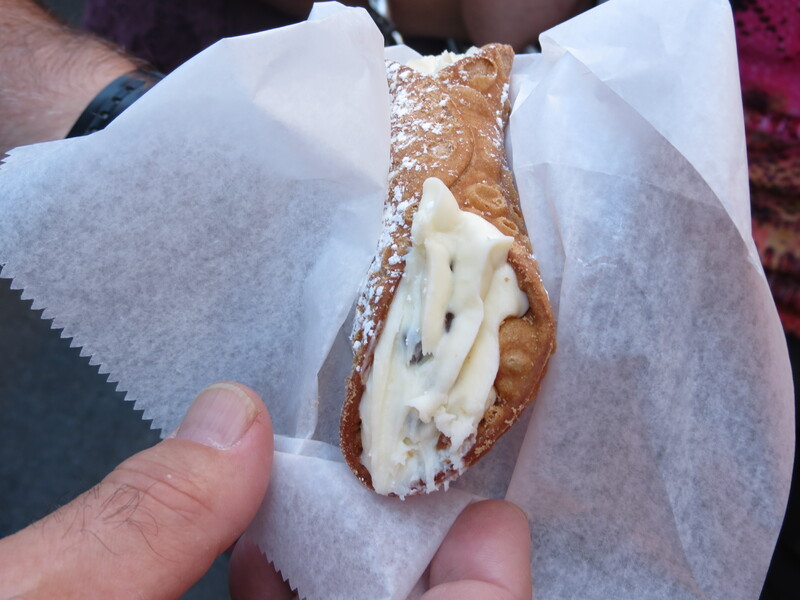 This year, I’m featuring cannoli from Caffe Palermo on Mulberry Street and Caffe Roma on Broome Street. Caffe Palermo has a sign advertising the best cannoli, and it is also the sponsor of the cannoli man. I thought the cannoli cream and shell were good and had a hint of cinnamon. Caffe Roma’s cannoli cream was a little less ricotta-y than Caffe Palermo’s and the shell was a bit more cinnamon-y. 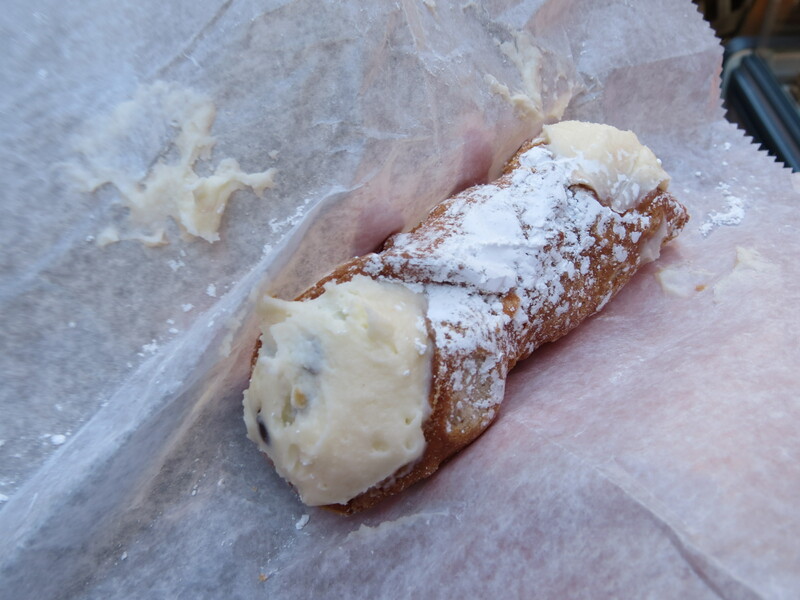 My favorite cannoli in Little Italy would probably be a combination of Ferrara’s and La Ferrara’s. OK, I know it’s two for Tuesday, but I’m going to throw in the frozen cannoli. I had wanted to try this last year. It’s a cannoli shell filled with soft serve vanilla, chocolate or swirl ice cream. I got vanilla. The soft serve isn’t the best quality, so I would opt for a real cannoli over this. 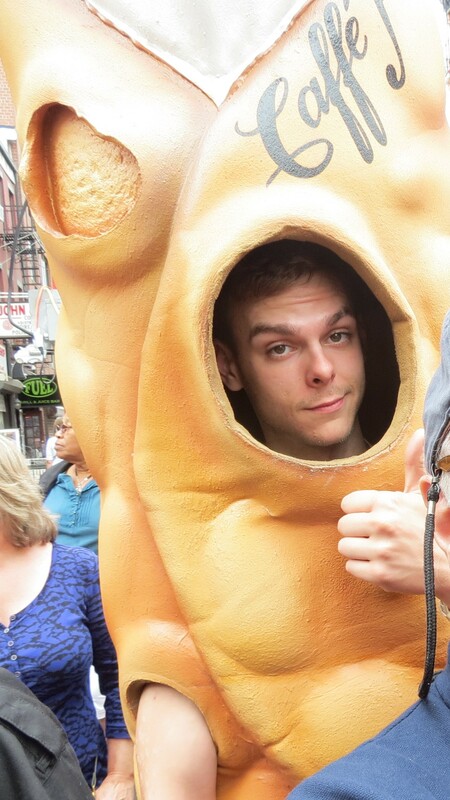 This entry was posted in Cannoli, Festival, Italian, New York and tagged Caffe Palermo, Caffe Roma, cannoli, frozen cannoli, Little Italy. Bookmark the permalink.